Eighteen-month-old Nile climbs on a statue at the garden. Festival attendees walk around the grounds of the garden. 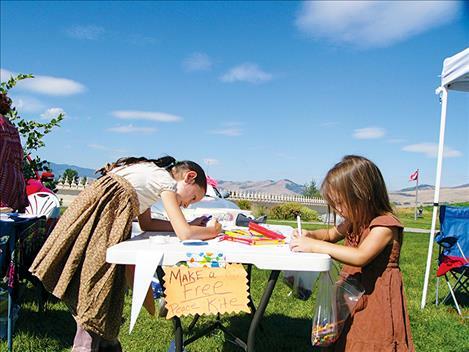 Children make kites at the Flathead Human Rights Coalition table. ARLEE — Families wandered quietly under a blue sky between 1,000 white Buddha statues on their way into the 14th Annual Festival of Peace on Sunday. 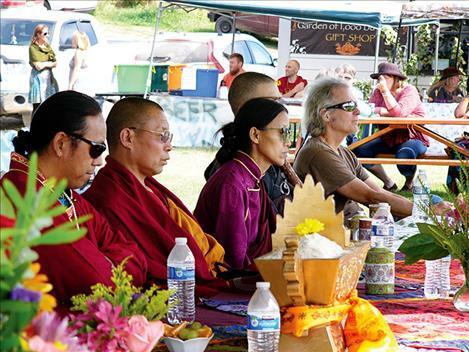 The event, held at the Ewam Garden of 1,000 Buddhas, drew visitors, vendors, and presenters from across the region. Claudette Carlson, administrator at the garden, said that the Festival of Peace extends the center’s mission of extending peace to everyone. She said that the festival provided a platform for those from all religions, philosophies, and cultures. “Your voice can be heard here,” she said. 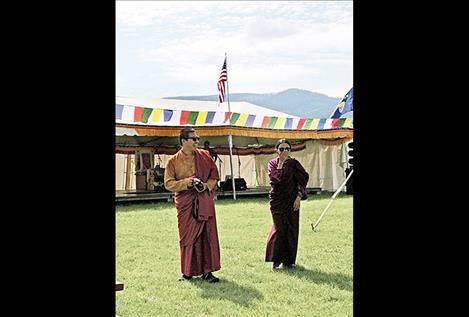 The eighth annual Walk a Mile for Peace was the first activity in the daylong event, and it continued with a variety of cultural performances throughout the day including a Tibetan cultural arts performance, Hindu spiritual music, and salsa dance. 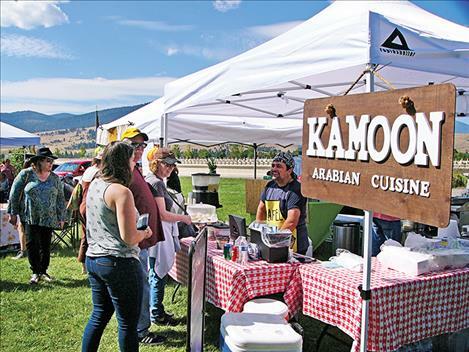 Vendors from Montana and Idaho sold food, crafts, and even offered massages. Others hosted tables to provide information for nonprofit groups. Tammy Miller represented the Flathead Human Rights Coalition at the festival. She said that a member of the coalition attends the festival each year. According to Miller, the current president of the FHRC, the peace festival provides an opportunity for the coalition to encourage community members to engage with local social justice issues in a peaceful manner. The FHRC provided materials for children to make “peace kites.” The tail of each kite was made from strips of paper printed with quotes on the subject of peace. Missoula Mayor John Engen spoke at the event. “Politics continue to be about finding ways to listen to each other, work together, and speak peace,” he said. Tulku Sang-ngag Rinpoche, the founder of the garden, also gave a speech. Through an interpreter, Rinpoche highlighted the need to treat all beings and the environment with compassion. 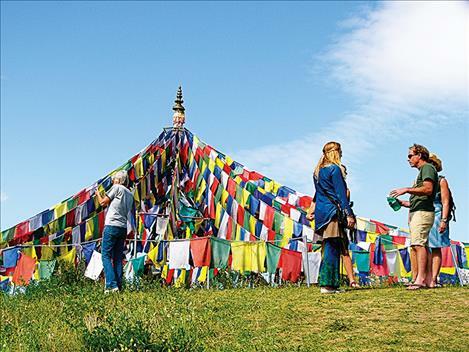 Rinpoche said that his goal in founding the center was to create a place where those interested in creating a more peaceful world could learn and grow into leaders. 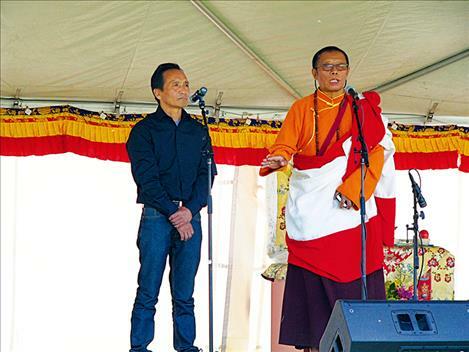 Rinpoche commended members of the Arlee Warrior Movement for suicide prevention who had spoken at the festival. Rinpoche said that members of that movement were enacting the kinds of change towards the good that he thought would bring about peace. “It gives me a whole lot of pleasure,” he said of the Warriors’ efforts. Judith Ellis-Tholt of Stevensville attended the festival with her daughter from Helena. She had never been to the event before. Ellis-Tholt said that she attended the event because it made her better able to spread peace in other parts of her life. “What’s better than peace and love?” she asked.